If you would like to pay by credit card, you need to know that all credit card transactions take place through Stripe or Paypal. They provide a secure online server so your transactions are protected. To shop, simply browse the flower Galleries, and place items you want to purchase in your shopping cart. When you are finished, click on the Check Out button. 1) Choose a delivery address as recipient's address and a billing address as your address. 1) Fill up Leave a message. 2) Check on Gift Card Message and fill up with Sender's name. 3) Check on Terms of service. 2) After placing an order then will issue an invoice and You will be receiving an invoice via PayPal by E-mail then you can Pay on the Invoice by your credit card easily. For the instant, you can pay to info@giftskorea.com via PayPal without the invoice. 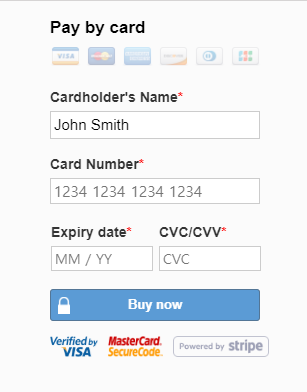 We recommend to use this payment method for the First-time visitor and has trouble in other payment methods. For Registered account User without PayPal account and Pay with Debit or Credit Card. 1) Choose a delivery address as recipient's address and check on Use the delivery address as the billing address. However, we've not sent any billing information to the recipient, it's for clear PayPal process only. When you Select Pay with your card or PayPal Account. 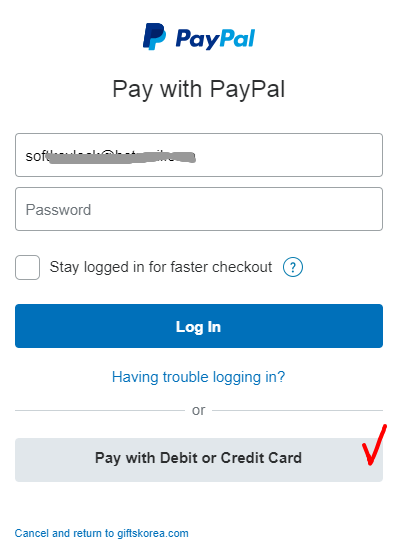 If you've not has the account PayPal then Click on the Pay with Debit or Credit Card and fill up your card information and forward. For Registered account User with PayPal account. If you have PayPal account then Fill up at the Pay with PayPal and Click on the Log In and forward. 1) Click on the Guest Checkout. 2) Fill up your email with name and delivery address including a mobile number of the recipient. Check on Sign up for our newsletter!, Click on the SAVE. After placed order then verify your delivery information as recipient's name, address, mobile no. in Korea, Gift message with sender's name, Preferred delivery date(local Korea time). If you need the update then let us know by email to info@giftskorea.com or Contact Us. If you are having a problem with PayPal, Please select invoice payment method located Top of payment methods. After placed order than will issue an invoice to you for pay on the invoice in easily. You can see Instant Checkout Example. All daily orders confirmation received before 8 pm (Pacific US time) will be processed on the same day in Korea. (Unless there is a specified delivery date) Destinations outside of Seoul, Korea will be processed within 24 to 48 hours. We will take the utmost care to ensure that your order is processed according to your specifications. Due to seasonal changes and availability, we may on occasion need to replace a type of flower with an equivalent size, shape and color tone due to availability during a particular season. All options(Cake, Chocolate, and others) are bought from nearest bakery from the delivery location for service than we will take the utmost care to ensure that your order is processed according to your specifications. Due to seasonal changes and availability, we may on occasion need to replace a type of options with an equivalent size, shape due to availability during a particular season and nearest delivery location's bakery. We will take the utmost care to ensure that your order is processed according to your instructions. Due to seasonal changes and availability, we may on occasion need to replace a type of packaging with an equivalent size, shape, and safety to availability during a particular season. When you purchase an item through www.giftskorea.com than your PayPal order number and GiftsKorea order reference number are different. 2. Recipient mobile or phone number to verify the location and time arrangement with the recipient. 3. Your contact information: Name, e-mail, available phone number. 4. Detailed delivery addresses for right delivery. 5. Preferred delivery date (at delivery local Korea time). 6. Your personal gift message or note to the recipient. It is important for you to provide correct order information for your gift! Including recipient's name, address and phone number in Korea for the delivery man of Parcel service provider. If any of the information is incomplete or inaccurate, it will most likely result in the product NOT being delivered on the designated day. The cost of any reshipped products due to incorrect address information is the sender's responsibility. Address corrections will be subject to carrier handling or correction fees. After dispatch, When we couldn't contact to the recipient by the wrong telephone no. and incorrect delivery address that will be returned to us then we will throw into a wastebasket by withered flower or any kind of cakes, fruits, Hampers spoils. It's not refunded. Therefore, please check all shipping information correctly and carefully for right delivery. Our messenger services use our delivery system with the channel network for same day delivery. Parcel Service - Cake, Rice Cake, Chocolates, Scented Candles, Nuts products, 3D Photo Crystals, Flower Parcel and related products. Parcel Service as Korea Post, CJ express, KD express, HanJin Express, etc. from across the country within 2~3 days. Not able to nominating delivery time. Mobile SMS, MMS - Giftspop service products as the Ice cream, Coffee, Pizza, Burger, etc will send Giftspop's voucher with a barcode to recipient's mobile no. in S.Korea within a day. Because we insist that each item arrives in perfect condition, we take great care with the packing and shipping of our products. Delivery and Handling charges are included in the final cost of each item. *Except for a remote and secluded place in[among] the mountains or island area, delivery and handling charges may apply. For Fresh Flower products, our delivery hours are 8:00 a.m. to 9:00 p.m. 7 days a week! Saturday and Sunday delivery are available at no additional charges by GiftsKorea. The Seoul metropolitan area will deliver within 24hours as same day, other areas will deliver within 24~48 hours. Normally, we can deliver within 3~4 hours after your order has been placed, when a recipient is at the delivery location. Our cut-off time is 2:00 PM (KST) for Same day delivery, depending on recipient's presence at the delivery address. Also, our carriers do deliver on New Years Day, Thanksgiving Day, Valentines Day, White day, Parents Day, Chuseok Holidays, Pepero day and Christmas Day or the day following these holidays. However, due to a high volume of delivery orders during these days, you will need to place an order as soon as possible (at least 3~4 days before) for an arrangement of delivery. First come, first serve! Please note that not all addresses are available for this special day/weekend delivery. For Parcel service products delivery, It may take up to 1~2 days for the dispatch to be completed, depending on recipient's presence at the delivery address. We cannot guarantee arrival time. Our cut-off time is 2:00PM(KST) for Next day delivery. For Saterday delivery cut-off time is 10:am(KST), Friday. For Monday delivery cut-off time is 10:00am(KST), Saturday. Sunday delivery by Parcel service is not available. When you order during Saturday/Sunday, your cake will be dispatched on Monday. Please see our delivery policy included seasonal statement with restriction. If you are sending your gift to a business or hotel please be aware that our carriers may deliver the package to a shipping and receiving department. Please let your recipient know to expect a perishable package. GiftsKorea.com is not responsible if the business is closed and the carrier is unable to deliver the package. For business addresses, please include as much information as possible including company name, telephone number, suite or hotel room number, recipient's name, and department, if applicable. Please note that we cannot deliver your flowers or gifts to P.O. Box address. Incorrect shipping information will most likely result in the product NOT being delivered on the designated day. The cost of any reshipped products due to incorrect address information is the sender's responsibility. Address corrections will be subject to carrier handling or correction fees. Therefore, please check all shipping information including recipient's mobile no. carefully. For each product or service, you order on any of the Site, you agree to pay the price applicable for the product or service (including any sales taxes, surcharges and any delivery fees for the delivery service you select) as of the time you submitted the order. Unless you and Giftskorea have agreed to an alternate billing arrangement in writing signed by Giftskorea, we will automatically bill your credit card submitted as part of the order process for such price. All prices are non-refundable. Without limiting other remedies, we reserve the right to charge a late fee on all past due payments equivalent to the lesser of one and a half percent (1.5%) per month on the unpaid balance or the highest rate allowed by law. You will pay for all collection costs, attorneys fees, and court costs incurred in the collection of past due amounts. 1. If any customer claims an order was not delivered, we ask that we are given at least 24-48 hours to investigate and to determine what has occurred. In many cases, delivery was attempted but the recipient was not at the address provided and no neighbors were available to accept the order. We reserve the right to attempt a redelivery if this occurs. If it is determined that we did not make the delivery attempt, it is our policy that we will provide you with a refund. 2. If an order is filled and delivered to the recipient and there is a question of the quality of the arrangement, the customer must contact within 24 hours of the delivery. Keep in mind that flowers are perishable and depending on the season and regions, arrangements may look different from the original photo of the item. Partial refunds or replacements may be considered after an investigation. No refunds or replacements will be made for any order should the recipient or sender not notify us within 1 day of the original delivery date. 3. “Substitutions Allowed" – Giftskorea will always attempt to fulfill an order as closely as possible. However, if the container, flowers or other items that comprise the order are unavailable, the order will be substituted with content equal to the original value of the order. This may mean that the recipient does not necessarily receive an arrangement identical to what is pictured though every effort is made to do so. 4. Giftskorea is not responsible for any order where the recipient refuses to accept the item and incorrect shipping information. We will not issue refunds to any customer where the recipient, for whatever reason, will not accept the item or refuses delivery. Also, you can find more information on FAQ.